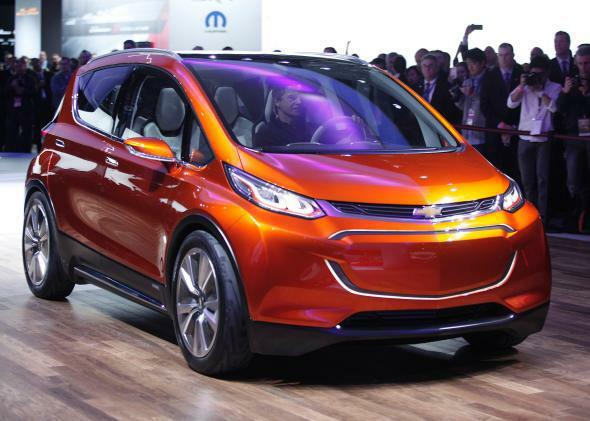 Detroit auto show 2015: electric Chevy Bolt concept car not a Tesla-killer. 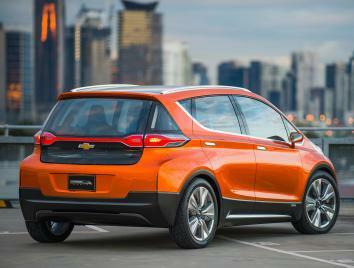 GM revealed the all-electric Chevrolet Bolt concept at the Detroit auto show Monday. It’s designed to go 200 miles on a charge, with a price of $30,000 after incentives. General Motors kicked off the Detroit auto show Monday, not with a bang, but with the hum of an all-electric concept car—and a lot of ensuing buzz. The Chevy Bolt—not to be confused with the plug-in hybrid Chevy Volt, which has been on the market for four years—would have a range of 200 miles and a target price of $30,000 after federal rebates, GM said. It sports a trendy “crossover” design, a 10-inch touchscreen, and multiple driving modes that trade off efficiency for performance. If he’s right, the Bolt could hit the market about the same time as Tesla’s Model 3. That’s the long-awaited “mass-market” $35,000 follow-up to the company’s groundbreaking $80,000 Model S luxury sedan. The timing is noteworthy, because the Bolt’s key features—range, price tag, giant in-dash touchscreen—are clearly intended as a response to Tesla’s Model 3 plans. No all-electric car today offers such range for under $40,000, even with federal rebates, and most don’t even approach it. The Nissan Leaf and BMW i3 will go only about 80 miles on electric power. Predictably, GM’s announcement sparked a round of headlines billing the Bolt as a potential “Tesla-killer.” (The most impressive, in terms of sheer hyperbole, might be the Seeking Alpha headline that included the phrase “RIP Tesla.”) If the phrase “Tesla-killer” is already familiar, that’s because virtually every electric car announced in the past two years has been greeted with the same tagline. In every case, it’s wrong. Remember when Apple came out with the iPad? For a year or two afterward, every new tablet from a rival electronics company was initially billed as an “iPad-killer,” because it offered similar features on paper. Last I checked, the iPad was still with us. To go mainstream, electric cars need a nationwide network of charging stations. The bigger problem with the phrase “Tesla-killer” is that it assumes Tesla would be better off if it were the only car company making viable all-electric cars. The truth is just the opposite. With the Model S, Tesla has cornered a niche market of wealthy techies and early adopters. But that market can only take the company so far. Its real goal is to bring electric vehicles into the mainstream, winning over buyers who would otherwise continue to drive gas-guzzlers. The greatest obstacle to Tesla’s long-term success is not rival electric cars, but a global transportation infrastructure that is built for gasoline-powered cars rather than battery-electrics. For Tesla to crack the mass market, it needs other major automakers to invest heavily in electric-vehicle technology, including a network of charging stations that would allow for long road trips in battery-powered cars. That’s why the company opened its patents to competitors last year. At this stage in its growth, Tesla wants more rivals, not fewer. So should everyone who believes that burning fossil fuels is bad for the environment. Tesla Just Opened Up All of Its Patents. Brilliant Move.